Womens Denim Shirt Size 18 Dispatched with Royal Mail 2nd Class. BNWOT Ladies New Look Stretch Denim Shirt Size 16. Dispatched with Royal Mail 2nd Class. BLUE DENIM. LENGTH 28". GOOD CONDITION. New Look Denim Blue Button Up Shirt Size 12. Slightly longer at the back.Condition is Used. Dispatched with Royal Mail 2nd Class. NEWLOOK LADIES BLUE DENIM SHIRT. 90% COTTON. New Look blue denim Shirt Size 12. Very good condition. New Look Denim Long / Oversize Shirt - Size 16. Condition is Used. Dispatched with Royal Mail 2nd Class. New Look Inspire Women's Denim Shirt - Tunic Length Size 20 Condition is Used. Has belt loops at each side as shown in the photo but no belt is included. Dispatched with Royal Mail 2nd Class. G orgeous Colour & Material. Gorgeous Ladies Top. New Look Ladies Denim look/ Style Shirt 12. Condition is Used. Dispatched with Royal Mail 2nd Class. NEW LOOK Ladies Blue Denim Shirt Size 16. Condition is Used. Dispatched with Royal Mail 2nd Class. New Look Light Blue Denim Dipped Hem Top - Size 10. Condition is Used. Look at second photo for true colour. From smoke and pet free home. New Look Denim Shirt Size 8. Condition is Used. Dispatched with Royal Mail 2nd Class. new look 12 Denim Top. Condition is Used. Dispatched with Royal Mail 2nd Class. 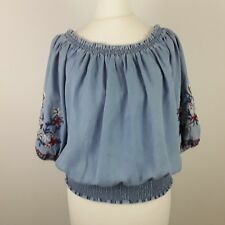 Womens New Look Denim Blouse Size 8. Condition is Very good. Dispatched with Royal Mail 2nd Class. Bnwt, size 14. New look. New Look Navy High Neck Cami Top, Size UK 10.
new look inspire size 22 Blue Denim Shirt With Poppers. Condition is Used. Dispatched with Royal Mail Signed For® 2nd Class. Sl ee ve le ss d en im shirt si ze t we lv e on ly worn on ce s o li ke n ew. New Look Denim Tunic Top Size 8! New Look Denim Tunic Top Size 8!. Condition is good, only been worn once. New Look light blue bleach wash denim shirt Size 14 • Cotton/Polyester. Non stretch Denim material. • Collared neck. • Long sleeves with single button cuffs. • Full button fastening. • Hip length. Very good used condition. UK bidders and paypal only. Smoke and pet free home. Buy 3 items and get postage for just £3.25 total. Go for breezy denim in this lightweight shirt. Pair with white kick flare jeans and slingback heels to finish the look. - Lightweight denim. - Casual fit. - Jisse is 5’9.5”/177cm and wears UK 10/EU 38/US 6. New Look Sleeveless Denim Shirt Size 12. Excellent used condition. From a smoke free home. Having a clear out so take a look at my other items, happy to combine postage. 1 li gh t bl ue vest. Fr om c le an n on s mo ki ng h ou se. 65% POLYESTER 35% COTTON [MACHINE WASHABLE]. SIZE SMALL. USED TOP IN VERY GOOD CONDITION. New Look Cameo Rose Denim Off The Shoulder Top. Bardot style with tie sleeves. Light weight and cool for summer. Condition is excellent as hardly Used. Dispatched with Royal Mail 2nd Class. Please see my other items. New look oversized denim shirt size 8. Condition is Used. Dispatched with Royal Mail 1st Class. Ladies tidy smart denim shirt. Nicely fitted. New look size 8 worn a couple of times . Condition is Used. Dispatched with Royal Mail 2nd Class. New Look Blue Patterened Top. Condition is Used. Dispatched with Royal Mail 2nd Class. New Look, Ladies Denim Shirt, Size 10. Condition is Used. Never worn. Dispatched with Royal Mail 2nd Class. Denim look top with double layered frill. Elasticated neck. Blue summer bandeau top from New Look. Only worn a handful of times. Strapless design with ruching to the chest. UK Size small (approximately UK size 10 - check New Look website if you are unsure) 95% cotton 5% elastane Machine washable I am also selling the same item in a plain white colour. Buy with confidence - 100% positive feedback. Please feel free to browse my other similar listings and email any questions, thank you. Condition is Used but good, worn only once.